I love to save egg cartons to use for crafts with the Sugar Snaps. But, I had to face it…if I did not start using some of these egg cartons soon, I was at risk for becoming the ‘egg carton lady’ on our street. Since the Sugar Snaps are into Hot Wheels, I figured I could use a bunch of them in one craft as a ramp. 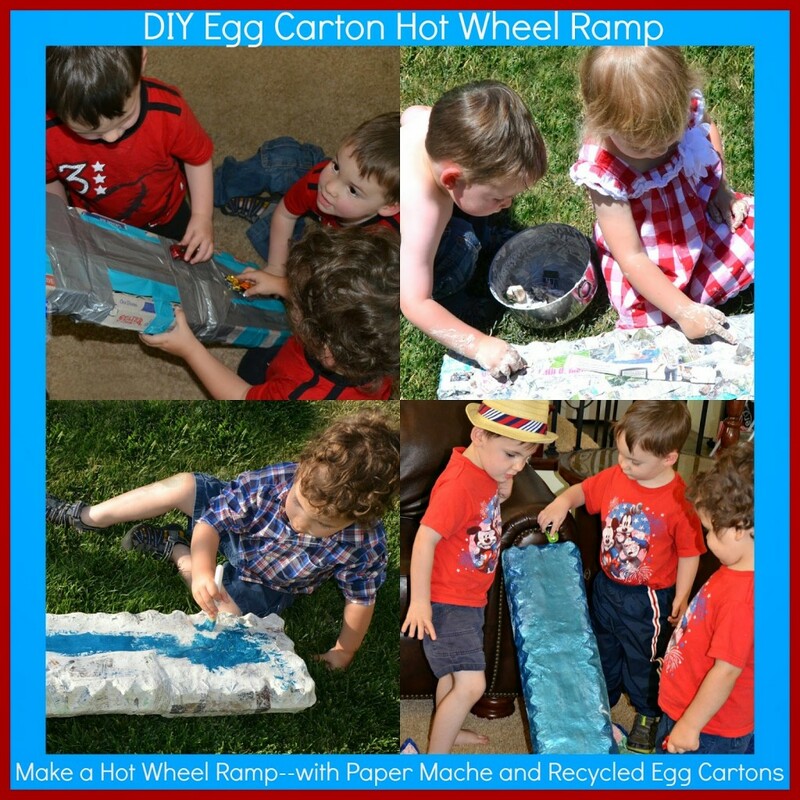 If you are not already saving egg cartons, you may have to save up for a little while to make this ramp. It requires six egg cartons! 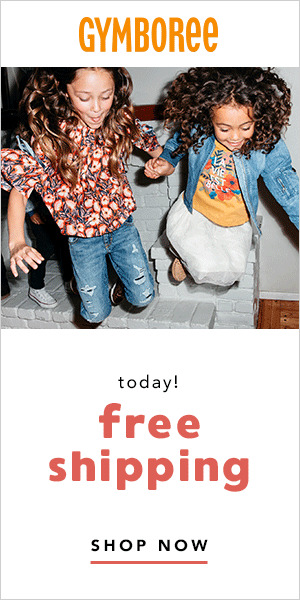 Have your children wear clothing that they can get messy in and then have them cover the entire egg carton structure in strips of newspaper and paper mache paste. Once it dries, you may wish to have them add another layer. I made two separate batches of the paper mache paste for the two layers. 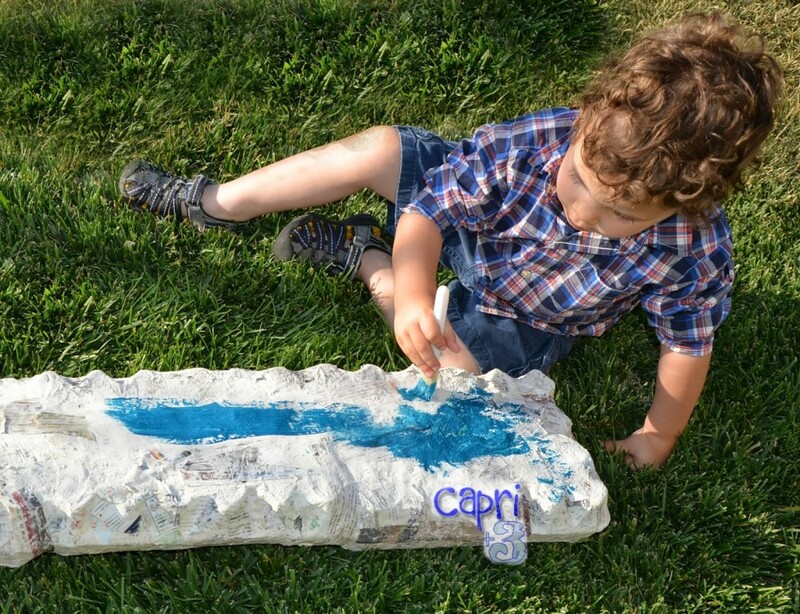 Once the second layer is dry, have your children paint the ramp. *A lesson from personal experience. Don’t leave the ramp on the lawn to dry when the sprinklers are about to come on. I yelled “Noooooooooooo” as I ran onto the lawn to get the soggy ramp. As you can imagine, paper mache and sprinklers are a bad combination. I had to repair the ramp before they could paint it. Once the paint is dry, it is ready for play. Store the ramp inside your home or garage. I found out from other projects that paper mache does not do well in the elements. The Sugar Snaps have spent hours playing with this ramp. I love that we had everything we needed to make it at home. It is not an easy feat to run to the store with the four of them to go and get something! How fun! The paper mache adds a craft project element to a DIY toy. I love this idea!